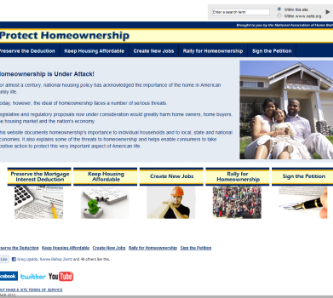 With numerous legislative and regulatory proposals taking aim at the American Dream of homeownership and federal elections just around the corner this November, NAHB is seeking to harness the public's well-documented support for this worthy cause through our newly launched website at ProtectHomeownership.com. This consumer-oriented website alerts readers to the numerous threats to homeownership, including recent proposals to scale back or eliminate the mortgage interest deduction, raise the minimum downpayment on most mortgages and revoke federal government support for the housing finance system. Importantly, the site also provides multiple ways for the public to take positive action to protect this fundamental element of American life. For example, visitors are encouraged to sign an online petition that urges lawmakers to keep housing as a national priority, and are told how they can participate in upcoming homeownership rallies that are scheduled in a number of communities across the country in coming months. Our site also connects visitors to social communities at Facebook.com/ProtectHomeownership and Twitter.com/4Homeownership to facilitate discussion on related issues and news. In all, we hope to empower citizens from all across this country to step up and tell their political representatives how important homeownership is to them, and how strongly they feel about the need to preserve critical homeownership incentives in the U.S. tax code and regulatory policy. Please visit this site and direct your customers and colleagues to it in the days ahead! For more information, view NAHB's press release or contact: Blake Smith (800-368-5242 x8583).